The Podium Bottle is 100% BPA-Free, so it's healthier from the very first sip. Innovative, self-sealing Jet Valve™ eliminates splatters and spills. Lightweight, easy-squeeze bottle delivers the right flow to quench your thirst. TruTaste™ Polypropylene lets you taste your water, not your plastic bottle. The Podium Bottle is 100% BPA-Free, so it's healthier from the very first sip. TruTaste™ Polypropylene lets you taste your water, not your plastic bottle. 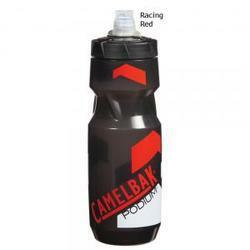 At CamelBak, hydration is at the core of what we do. CamelBak is the inventor of the hands-free hydration category and the global leader in personal hydration gear and accessories. With a mission to continuously reinvent and forever change the way people hydrate and perform, CamelBak offers the world's largest range of hydration packs, accessories and reusable BPA-free water bottles for outdoor sports, military, travel and a healthy lifestyle.